As the summer is getting closer, I find more fresh and sweeter corn in the market. With fresh corn and kabocha, I like making simple potage. It’s a complete vegan dish and I make it with my soup & stew donabe, “Miso-shiru Nabe”. After sautéing sweet onion, ginger and garlic in olive oil, cubed kabocha pumpkin is added, followed by vegetable stock. Once the broth starts simmering, corn is added (save some to add later). 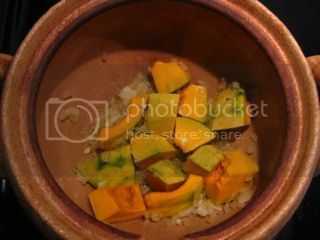 When kabocha becomes tender, the entire components in donabe are transferred to a blender (I like to use Vitamix for the very smooth result), and pureed along with some Saikyo miso (sweet white miso), shio-koji, and white pepper. 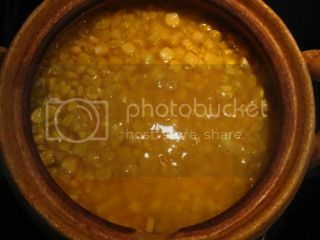 The soup is transferred back to Miso-shiru Nabe, and saved remaining corn is added and heated through. That’s it. To serve, just drizzle a small amount of very fine olive oil and sprinkle some white pepper. The flavor is so pure, sweet, and just wonderfully packed with corn and mild kabocha. You can serve it hot or cold. Here’s my recipe. In “Miso-shiru Nabe”, heat 1 tablespoon olive oil and sauté the onion, garlic, and ginger over medium heat until the onion is very soft (about 5 minutes). Add the kabocha and sauté for 1 minute. Add the vegetable stock. Turn the heat to medium-high. Bring to a boil, and reduce the heat to simmer. 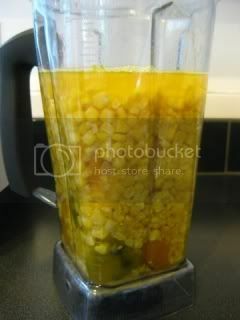 Add all the corn except for 1 cup (240 ml). Simmer until the kabocha is cooked through (about 5 minutes). Turn off the heat and let it rest for 10 minutes. 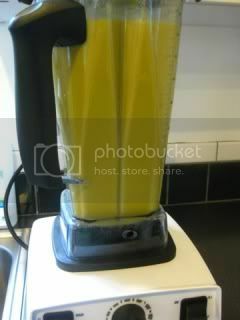 Transfer the content to a blender. Add the miso, shio-koji, and some white pepper. Blend until smooth. Transfer the blended mixture back to “Miso-shiru Nabe”. 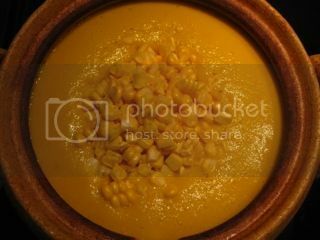 Add the remaining corn and bring to simmer over medium-heat. Simmer for a few minutes. 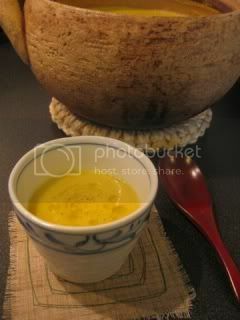 Serve into individual soup bowls and with some drizzle of fine olive oil and sprinkle of white pepper. 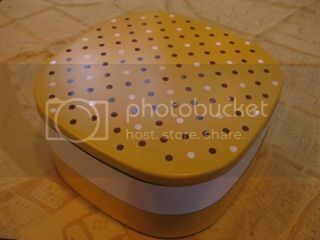 *You can also transfer to a different container and refrigerate to serve it cold. 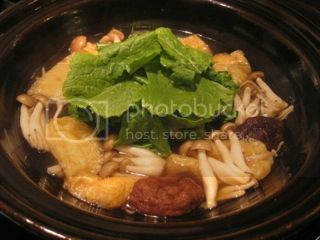 With just two main ingredients...mushrooms and friend tofu pouch ("abura-age"), you can make a wonderful healthy one pot donabe hot pot meal. 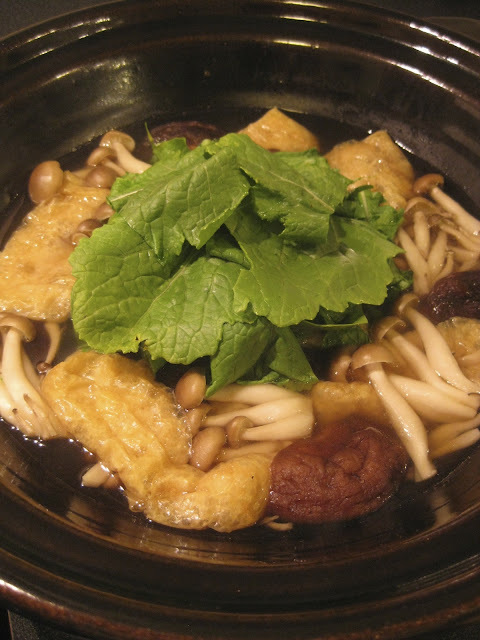 This is a "Shojin", or buddhist temple-style vegan dish. It's a regular dish at my home, because it tastes so soothing and nice. For this dish, I use Kyoto-style shallow donabe, "Kyoto Ame-yu". Just combine the ingredients in the donabe and heat. Add some kabu or other green leaves right before serving. With the remaining broth and components, I like making finishing ("shime") udon noodle course. So good. Suggested condiments: ground roasted sesame seeds, yuzu kosho paste, etc. 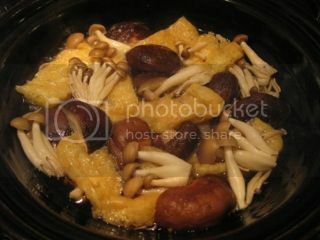 *I sun-dry mushrooms half to full day before use, so that the mushrooms will release more umami flavor to the broth. In the donabe, combine the water, sake, and dashi kombu. Let the kombu soak for 30 minutes. 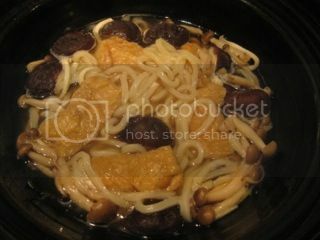 Add the mirin and soy sauce, followed by both kinds of mushrooms and abura-age. Cover and set the donabe over medium heat. Bring to simmer. 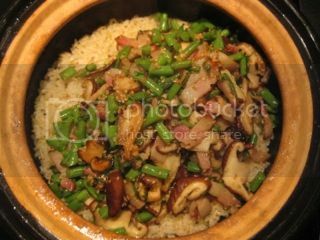 Once the broth starts simmering, let it continue to simmer for 3-5 minutes until the mushrooms are very tender and the broth is richened. Add the kabu leaves and simmer for 1 more minute. Serve with your choice of condiments. Leave half of the content, if you want to make udon noodle course. Heat the leftover broth and ingredients over medium-heat. Add the udon noodles and simmer until your desired doneness. Serve with your choice of condiments. 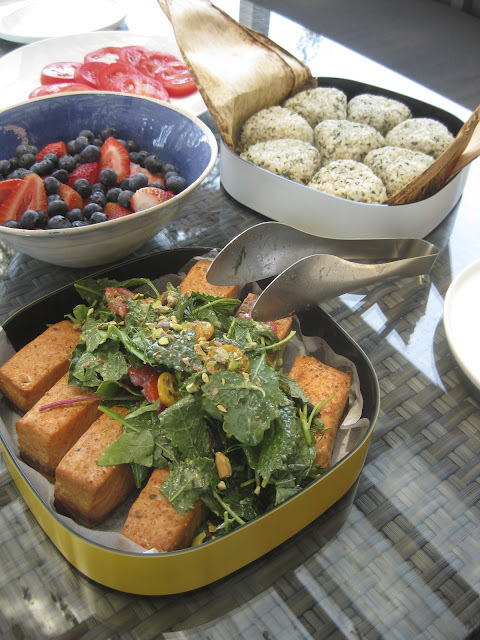 I was invited to a pot luck brunch at a friend's house in Hollywood last Sunday. 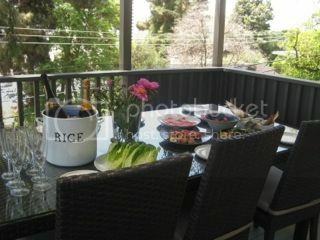 We did a nice outdoor meal in the balcony with the nice urban view. I made two donabe dishes and packed in my picnic bento 2-tier boxes. 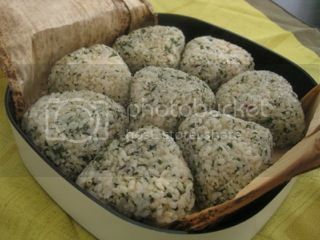 With double-lid donabe rice cooker, "Kamado-san", I made green tea onigiri (rice balls). I mixed in coarse ground "tencha" (very delicate baby green tea leaves used for making matcha powder) and plum kombu tea powder. Combination of green tea and plum kombu tea flavors bring the nice aromatic character to it. 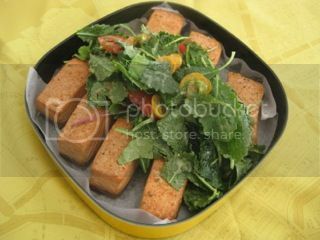 With donabe smoker, "Ibushi Gin", I smoked salmon filets with Japanese apple wood smoke chips, and served with baby kale and kumquat salad in apple cider vinaigrette. I'm glad everybody enjoyed my dishes. We had extremely warm couple of days last week, and I wanted to make something with stamina and nice spicy kick. So, I decided to make mixed rice dish with my double-lid donabe rice cooker, "Kamado-san", and season with this really tasty Yuzu Shichimi Salt I brought back from Japan. t's a mixture of shichimi togarashi (mixed pepper spice) with powdered yuzu rind, dry shiitake mushrooms, dry kelp, dry scallop, etc. So, it's like ultimate umami-packed spice salt. If you don't have yuzu shichimi salt, for this recipe, you can substitute its recipe amount below it with 2/3 teaspoon of each salt and shichimi togarashi. Just sauté the ingredients while the rice is cooking. 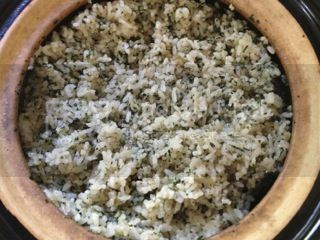 Once the rice is ready, just mix together and serve. It's so good! 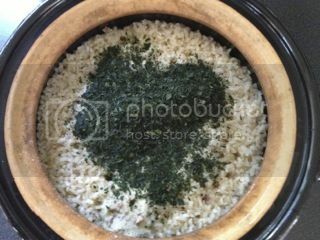 In "Kamado-san", combine the rice and water, and cook according to the basic plain rice instructions. Meanwhile, in a sauté pan, sauté the bacon over medium-heat. 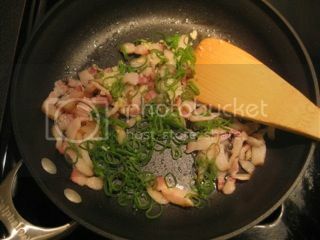 Once the bacon is almost cooked through, add the Tokyo negi (save some for garnish) and garlic. Sauté until aromatic (1-2 minutes). 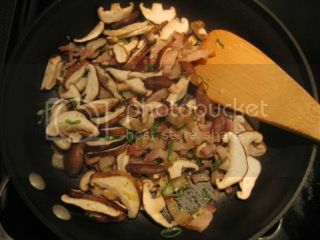 Add the shiitake mushrooms and continue to sauté for a couple of minutes. 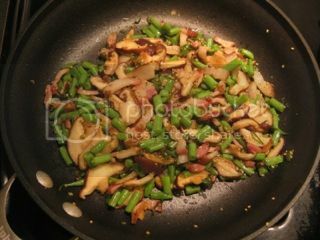 Add the haricot vert and sauté for additional couple of minutes. Add the sake to deglaze. Once the sake is reduced down, add the soy sauce and yuzu shichimi salt. Stir. Once Haricot vert is cooked to crisp tender, turn off the heat and set aside. When the rice is ready, add the sautéed ingredients to the rice and mix. Garnish with the remaining Tokyo negi. With the rest of the California bamboo shoots from Penryn Orchard, I knew what I was going to make. 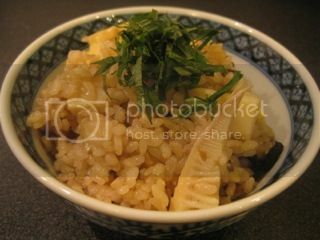 I made "Takenoko Gohan", it's bamboo shoot rice and my favorite bamboo dish! 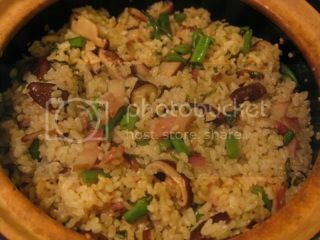 When I was a child, I always requested my mom to make Takenoko Gohan over and over in the spring season. 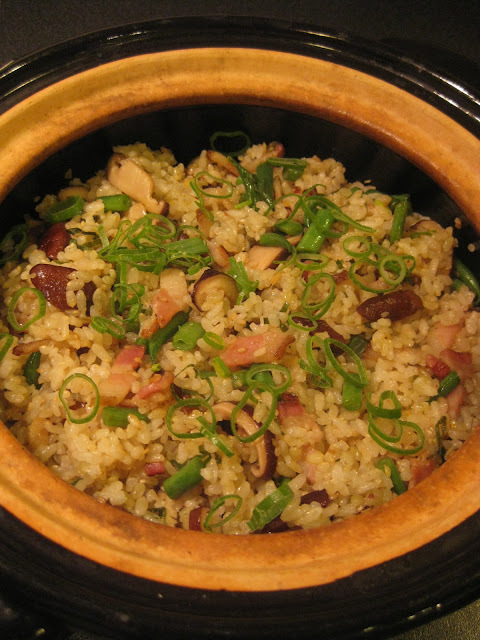 And, with doubld-lid donabe rice cooker, "Kamado-san", I make almost as delicious Takenoko Gohan as mom's. In "Kamado-san", combine the rice, dashi stock, mirin, soy sauce, and salt. Let the rice soak for 20 minutes. 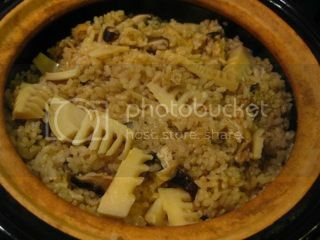 Spread the shiitake mushrooms over the rice, followed by "abura-age") and bamboo shoot in layers. 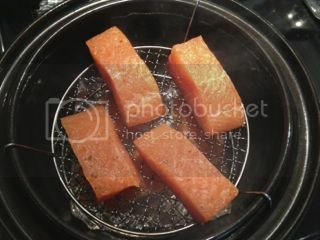 Cover "Kamado-san" with both lids and cook over medium-high heat for 13-15 minutes, or until 2-3 minutes after the steam starts puffing out of the top lid. If you want the nice crust ("okoge") on the bottom cook for extra 1-2 minutes. Uncover and fluff the rice. Garnish with some sliced shiso leaves. 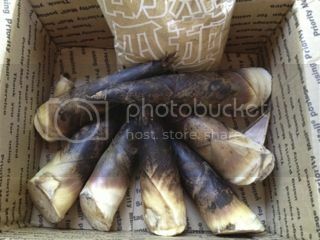 Pre-cooked packaged bamboo shoots are available all year round. But, they are nothing compared to freshly-foraged bamboo shoots, which are only available in the short window of the spring time. 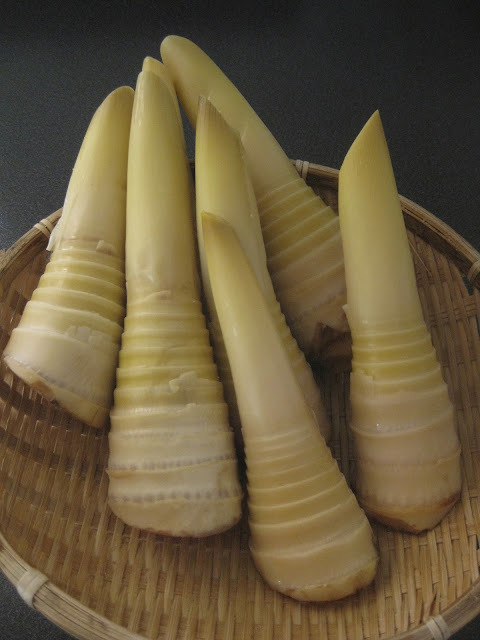 So, now is the time...with Penryn Orchard's bamboo shoots...fresh from their farm in California. 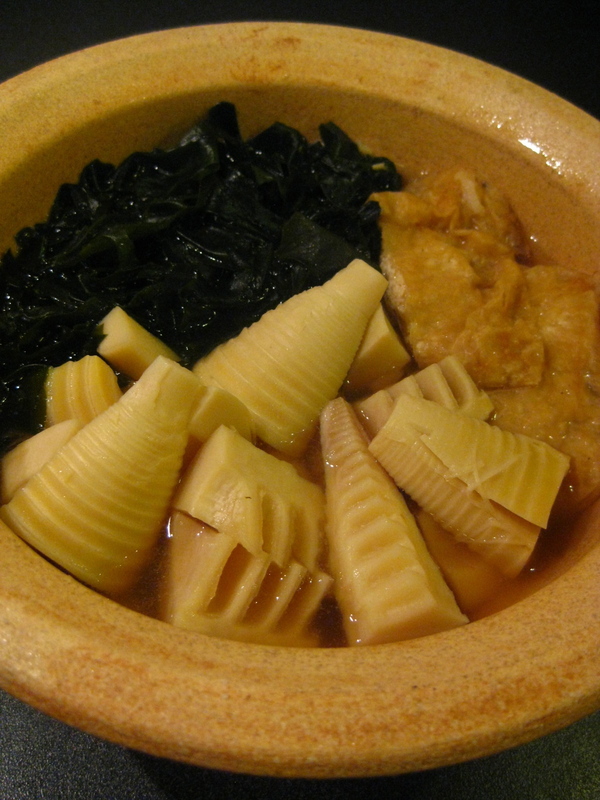 I decided to make "Wakatake-ni", which is an extremely classic bamboo shoot dish. 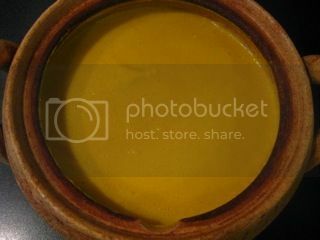 To best showcase the fresh and pure flavor of bamboo shoot, making the rich pure broth is extremely crucial. So, I shaved a generous amount of my special "honkare-bushi" dry bonito to make dashi stock. It was the end of this piece, so shaving a little piece was quite tough and time consuming (because you don't want to shave off your skin!). 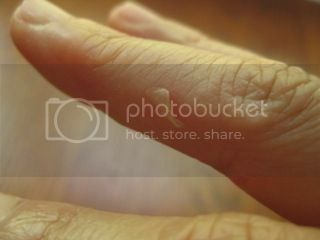 At the end, instead of cutting my finger with the bonito shaver's blade, I had a small blister in my finger and a part of skin peeled. I've been through so many dry bonito pieces over years and it happens every time I deal with a last leftover piece. But, it's worth it. Once you make nice dashi stock. Making "Wakatake-ni" is very easy. Combine the ingredients for the broth with cut bamboo shoot (and abura-age). 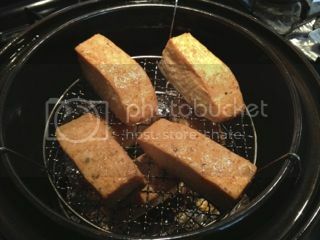 Simmer with additional shaved bonito flakes ("katsuobushi"). This process is called "Oi-gatsuo", or literal translation is "chasing with more bonito". When cooking ingredients with very clean or less strong flavor, dashi stock is further fortified with additional bonito flakes for more umami flavors and most importantly for the aroma. I used a large tea bag and put freshly-shaved bonito flakes to infuse in the broth. Once the bamboo is simmered and seasoned long enough, "katsuobushi" bag is removed and wakame seaweed is added to finish. 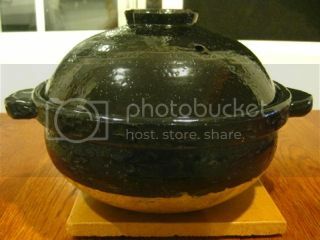 For this dish, I used a mini-size classic-style donabe, "Yu Kizeto". Here's my recipe. 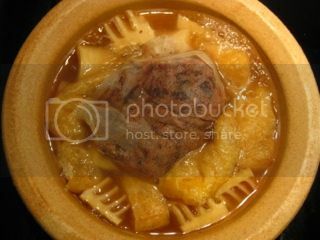 In the donabe, combine the bamboo shoot, "abura-age", dashi stock, sake, sugar, and mirin. Bring to a simmer over medium-high heat. Turn down the heat to medium-low and simmer for 3 minutes. Add the soy sauce and salt. 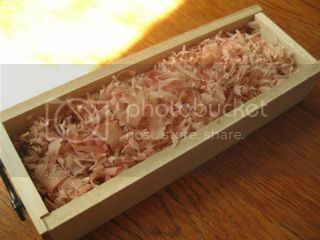 Put "katsuobushi" in a sachet and add. 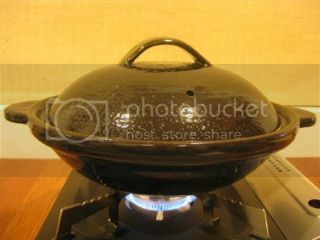 Put a drop lid ("otoshibuta") on the surface, cover with lid, and continue to simmer for 10 minutes. Remove the sachet of "katsuobushi". Add the wakame seaweed. Simmer for a couple of minutes. Turn off the heat and let it rest for 15-30 minutes. 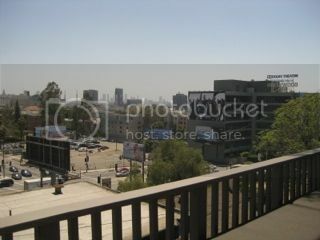 You can enjoy it at a hot, warm or cool temperatures. I got a really great gift the other day. It was a package of extremely seasonal, bamboo shoots...these are grown by Penryn Orchard (yes, the same grower who makes awesome hoshigaki) in California. 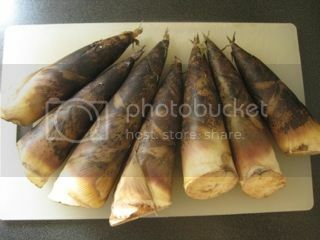 For (almost) any Japanese people, bamboo shoot is one of the most highly-praised seasonal ingredients in the spring. 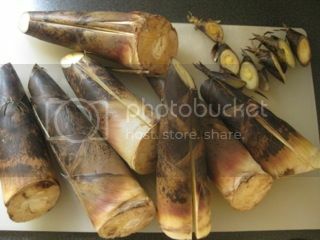 During the season, in Japan, we eat tons and tons of bamboo shoot. 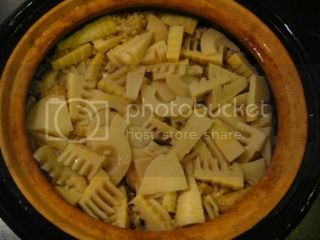 As I had never tried California bamboo shoot, I was so thrilled to cook it myself. These American bamboo shoots are much smaller than regular Japanese bamboo shoots, yet they look really fresh and pretty. 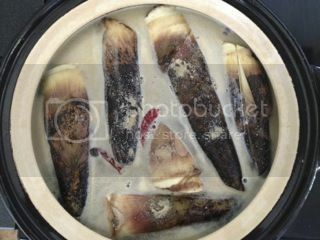 Because freshly foraged bamboo shoot contains toxic hydrocyanic acid, before it's ready to be used in cooking, bamboo shoot needs to be pre-cooked with rice bran flour ("nuka") to remove the toxin. 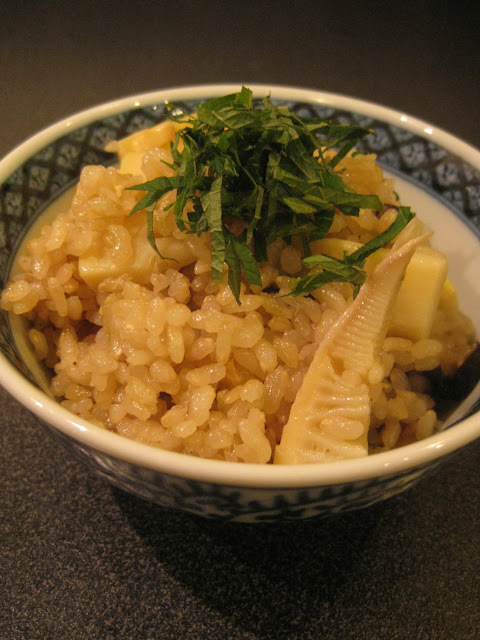 By cooking bamboo shoot with rice bran, bran's starch removes the toxin from bamboo shoot and absorbs it. Also, by adding dry red pepper, it helps removing bitterness from bamboo shoot. It's a traditional simple process, which we still practice every time we get fresh bamboo shoot. And, every time, I feel high respect for our ancestors with such wisdom. 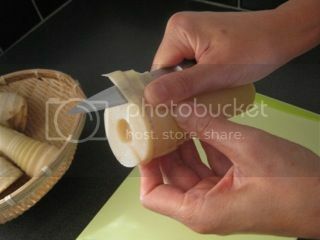 It's also very important to do this process as soon as you get the fresh bamboo shoot, whether you use it soon or not. 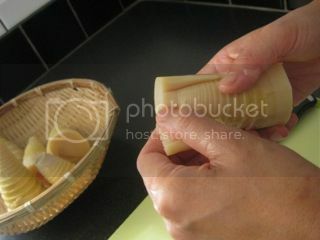 The longer you keep it (without pre-cooking), the more the bitterness in bamboo shoot increases. 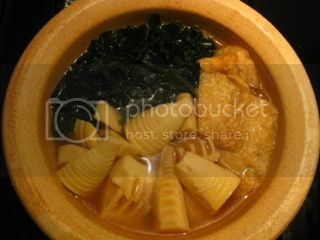 Here's how you can prepare fresh bamboo shoot in donabe. 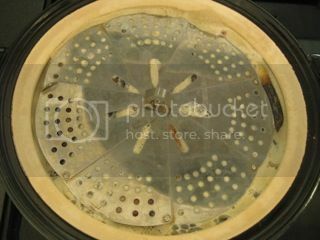 For this process, I needed a large-size donabe, so I used donabe steamer, "Mushi Nabe" without the grate as a classic-style donabe. 1. Cut off a tip from each bamboo shoot at an angle. Slash to make an incision just deep enough to barely touch the tender part lengthwise. 2. 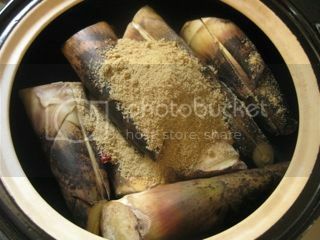 Combine the bamboo shoots, and enough amount of water to cover them in the donabe. Add a big handful of rice bran ("nuka") and a couple of dry red peppers. 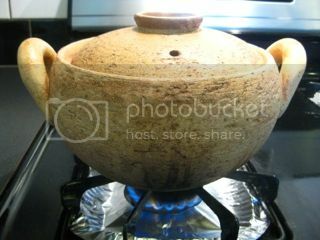 Bring to simmer and put a drop lid ("otoshibuta") on the surface. 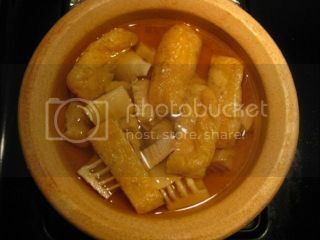 Simmer over low heat until the thick part of a bamboo shoot is just tender when inserting a skewer. 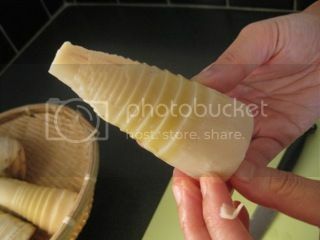 (35-40 minutes for a small to medium-size bamboo shoot.) Turn off the heat and let it cool down completely. 3. 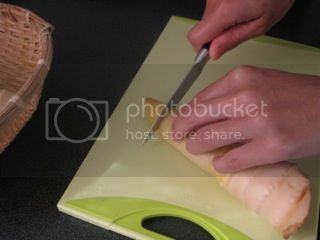 Peel the tough leaves of each bamboo shoot to reveal the tender interior. Cut off the firm tip and bottom parts. 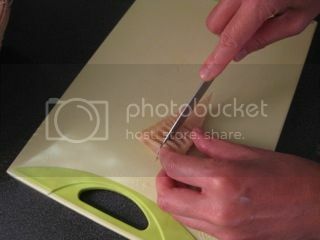 Also, shave off the bumpy part from the bottom part's outer layer. 4. 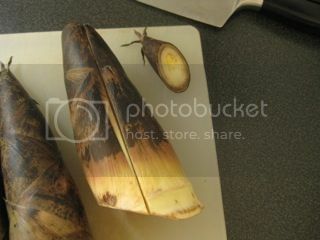 Once all the bamboo shoots are peeled out of tough leaves, soak them in cold water for 30 minutes to remove any excess bitterness. 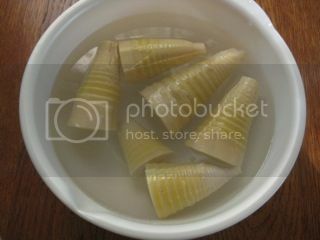 Pre-cooked bamboo shoots can be kept in water and refrigerated for up to 1 week. Meanwhile, water needs to be replaced once a day. Because, I couldn't wait until I use the freshly prepared bamboo shoots for cooking later, I sliced and ate one of them just as is. 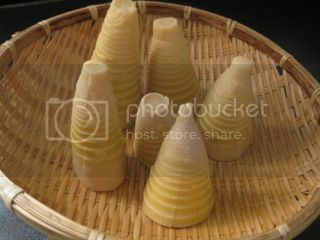 The tenderness, sweetness, and all the natural pureness of the bamboo shoot was just so special. Amazing. 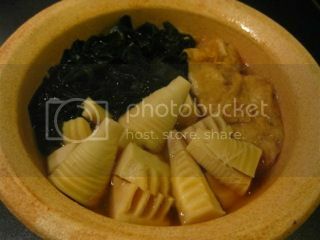 In the next postings, I would like to introduce a couple of donabe dishes with bamboo shoot.